Progressive Chat: Watch Melissa McCarthy played Sean Spicer going nuts on the press in a SNL sketch. SNL is known for it's bitting political satire. They're portrayals are truly iconic: Dana Carvey as President George H.W Bush, Darrell Hammond as President Bill Clinton, Will Ferrell as President George W Bush. More recently Tina Fay was a spot on Sarah Palin and Kate McKinnon made us smile and cry this election season with her taking on Secretary Hillary Clinton. They stay as true to the persona and mannerisms as possible. 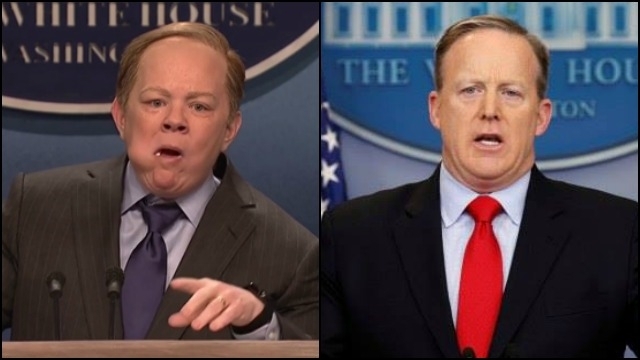 In a rare move, they brought on Alec Baldwin to play The Donald and Melissa McCarthy to become Sean Spicer in a masterful casting. Melissa McCarthy played Sean Spicer going nuts on the press in a SNL sketch and perfectly encapsulated the madness and lies of the last week's press conferences. There is not much more to say than to give a big Thank You to McCarthy for a much needed smile and for being game to take on this madness. Here's hoping an Emmy comes your way!